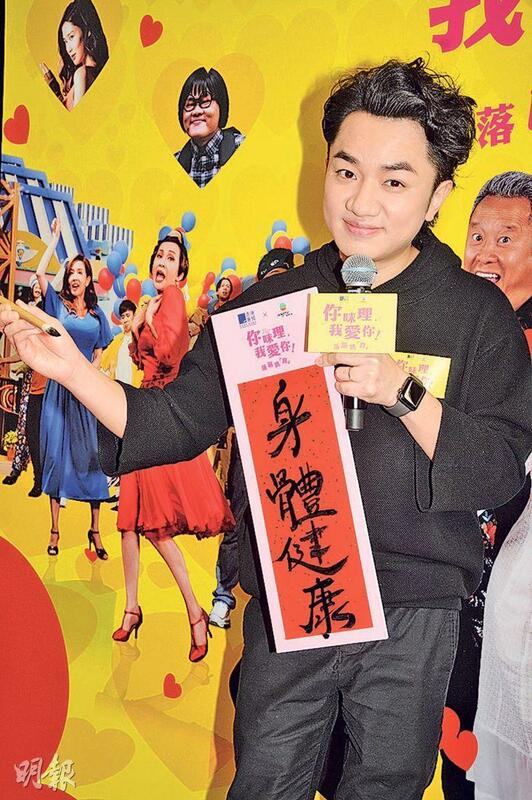 Wong Cho Lam yesterday promoted his Lunar New Year film I LOVE YOU, YOU'RE PERFECT, NOW CHANGE! (NEI MAI LEI, NGOR OI NEI) in Sham Shui Po. He wrote couplets and gave away two golden pigs and movie tickets. Cho Lam said that he and his wife Leanne Li Yanan would occasionally come to Sham Shui Po to eat. As for his directing debut Lunar New Year film opening Thursday, he admitted that he was very nervous because this year would have a lot competition. He did not dare to talk about the box office, but only his would be a musical so he was happy. "To beat others first you have to beat yourself, I hope to win word of mouth first!" 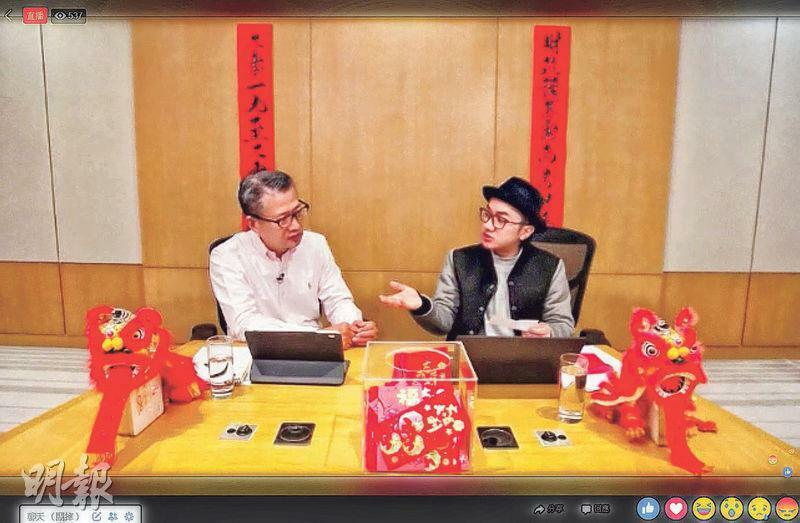 Speaking of two days ago the financial secretary Paul Chan Mo Bo went live on social media to collect public opinion on the government budget, Wong Cho Lam was the host. He received many "angry" emojis. Cho Lam near the end of the live broadcast counted over 1,000 "angry" emojis and also almost 100 "hearts". Cho Lam said that actually last month at an event where show business expressed its opinions about the budget, the financial secretary asked if he would be interested in a live broadcast. He said that before he started he asked the financial secretary if he would afraid of seeing "angry" emojis online. The secretary answered that he expected that. Cho Lam said, "Actually this also enables expressing opinions in many different ways. I watch the news everyday, this time I can ask questions in person. So all the questions online like medical personnel's workload complaint, the government's HK$ 4,000 "care and share" project debacle, unemployed seniors (age 60-64)' HK$ 200 decrease in benefits, I asked them all and got some responses. We can even express a little together!" Did he feel there is any room for improvement? Cho Lam said, "This HK$ 4,000 scheme probably wouldn't be so troublesome, it has been in limbo for a long time. They said that they have already invested on additional bed space, but they still have to let people know how the resource was spent. The front line medical personnel has a lot of grievances, actually they are in a tough spot and really have to express themselves. The senior welfare shouldn't lose HK$ 200 because this is like threatening someone to have to work. After the live broadcast the government cancelled this project, so everyone can air different opinions and displeasure!" Should artists not be connected to politics? Cho Lam said, "Ah Jeh (Liza) Wang Ming Chuen would be my role model. She dares to speak up due to her care for the community. Actually we didn't filter out any questions for our live broadcast. Except for the foul language, I asked the financial secretary questions directly!" As for I's premiere tonight, Cho Lam said that it was time for his wife to appear. "She originally has seen it many times at home in the bedroom, but she still wants to support me her husband. However this Valentine's Day we will be on holiday in Japan. It happened to be our wedding anniversary. She just finished her maternity rest so she could eat whatever she wants." Would he be reluctant to leave their baby girl? Cho Lam said, "Even if I don't want to I have to, I should take care of my wife a little more. I don't want her to be stressed from taking care of the child everyday!"